Wheatgrass is a type of young grass grown from wheat seeds contains an abundant amount of nutrients, including iron, calcium, magnesium, amino acids, chlorophyll, and vitamins A, C and E. Proponents claim this nutrient-rich content enhances immunity, eliminates harmful bacteria in the digestive system, and clears the body of waste. Ann Wigmore developed a dietary program called the wheatgrass diet based on raw wheatgrass as its primary nutritional ingredient. Wigmore claimed the diet could cure and prevent diseases. However, there is limited scientific evidence supporting Wigmore's claims. The wheatgrass diet involves avoiding all meats, dairy products and cooked foods. The wheatgrass diet emphasizes "live foods," such as uncooked sprouts, raw vegetables and fruits, nuts, and seeds. Wheatgrass dieters also use wheatgrass to make juice drinks. According to Wigmore, wheatgrass needs to be cut from growing plants, juiced and consumed fresh within three hours in order to obtain its live enzymes. Wigmore suggested that the live enzymes from wheatgrass can detoxify the body and cleanse the liver. Ann Wigmore theorized that decomposing food within the intestine forms toxins that circulate throughout the bloodstream and cause cancer. She proposed that the wheatgrass diet could cause tumor shrinkage in cancer patients or eliminate cancer all together. Ann Wigmore also theorized raw wheatgrass contained beneficial enzymes that could detoxify the body, especially because it contains chlorophyll. Wigmore called chlorophyll "the life blood of the planet," according to the NCAHF. Wigmore hypothesized cooked food destroyed the chlorophyll and deactivated the beneficial enzymes found in raw grasses and vegetables. Most nutritionists recommend a diet of whole, nutrient-dense foods for people undergoing cancer treatment or seeking protection from cancer recurrence, and wheat grass juice may be a healthy addition to this type of diet. 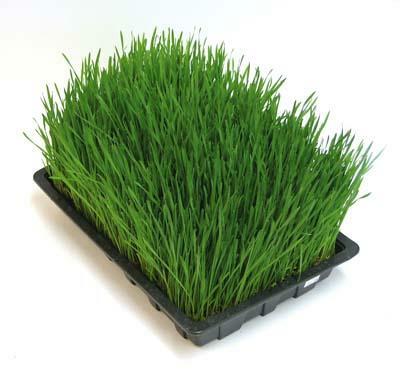 Health-food stores often sell small flats of wheat grass you can grow at home to use for juicing or have juice bars where you can purchase the juice freshly made. However, wheat grass juice may cause nausea, according to the Memorial Sloan-Kettering Cancer Center, worsening a common side effect of treatment. In addition, fresh wheat grass may harbor microbes that can cause an infection in people with compromised immune systems, such as cancer patients. Talk to your doctor about the use of wheat grass juice in conjunction with cancer treatment.